South Branch Tavern & Grille offers full views of the river and city skyline in a beautiful, lush atmosphere, complemented by savory and distinctive American fare. With a diverse selection of menu items to choose from and a lengthy craft beer list, South Branch is the perfect destination for lunch, happy hour, and private parties. 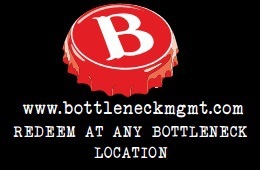 Gift Cards can be used at any Bottleneck location. For balance inquiries call the phone number to a South Branch Tavern And Grille's location below.